I like to mix vegatables and cheese to create interesting pasta sauces, and this one is a good example. You could easily add some chicken to this dish to create a complete meal in a bowl. Heat the oil in a heavy saucepan, and then add the onions and pancetta and cook until the onions are tender, about 5 minutes. Add the garlic and zucchini, and cook until the zucchini is almost tender. Add the wine, olives, capers, sun-dried tomatoes, gorgonzola cheese, and mix well. Season with salt and pepper, and cook for another minute or two until the cheese melts and a sauce is created. Cook the pasta until al dente. Mix together the drained pasta and the zucchini mixture over medium heat for a minute of two. 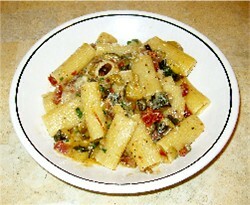 Garnish with the chopped parsley, and serve with grated cheese if desired.